We here at Choose a Challenge get asked all the time “What are the best ways to fundraise?” and we truly believe the best people to ask other than our charity partners are our current and former student trekkers! 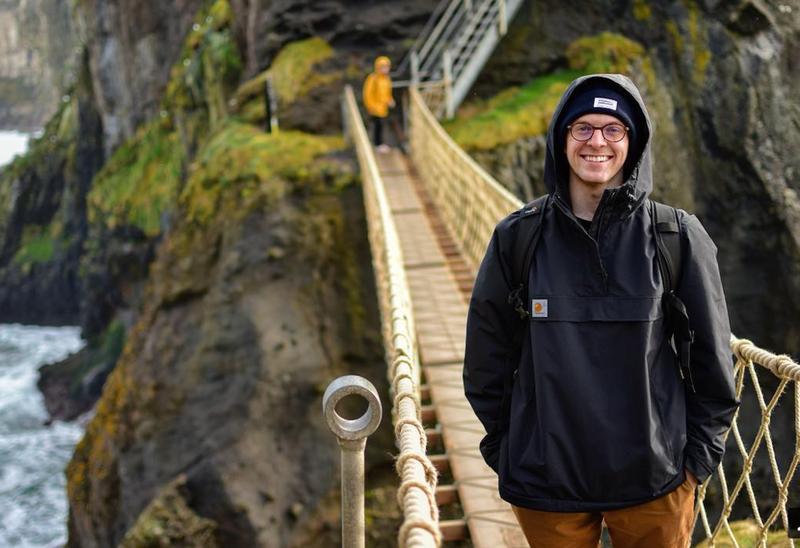 That’s why we’re serving up another student fundraising story with one of our current participants, Liam Mahoney, a Senior at Northeastern University in Massachusetts. Liam not only stuck out to us when he easily eclipsed the $1,000 fundraising mark only a week into his journey, but when we learned he was involved with Big Brothers Big Sisters earlier on in his life as well. So we sat down to ask him how his experience has been thus far, what has worked for him and why this trip is so important to him. 1. How did you hear about Choose a Challenge, and what was the deciding factor in signing up for one of our trips? Honestly, I got lucky and stumbled upon Choose a Challenge on my Facebook feed. One of my friends clicked that they were interested in the information session, and it looked like such a cool opportunity I instantly reached out to see how I could sign up. Growing up mentorship played a huge part in my personal development, helping me overcome some serious anxiety and depression. Once I was in the position to do so, I also tried to act as a mentor to those suffering from similar situations as my own. I thought that Base Camp was a perfect opportunity to begin working towards my life-long goal of summiting Everest, and once I learned I could do this while also supporting Big Brothers Big Sisters, nothing was going to stop me from going on this trip. 2. What were your initial thoughts and strategy on fundraising when you first started off? Initially, I was a little overwhelmed by having to fundraise $5,500 while finishing my last internship of college, planning for my last semester, and even beginning the job application process. However, once I broke it down by week and realized how much I would have to raise weekly to achieve my goal, I realized how feasible it actually was if it I put my mind to it. I reached out to my family first to try and get those first donations, and then my closest friends. The support they showed helped motivate me and make me comfortable reaching out to people via social media and people that I didn't know as well. I'm currently working on finishing a six-month internship at VMware in Palo Alto, California, but am looking forward to returning to campus in January and continuing to fundraise for such a great cause. 3. You've already raised over $1,000 in the first few weeks. Can you detail how you've achieved this and what practices worked best for you? As mentioned above, reaching out to those I know on a personal level worked best for me. These people want to see you achieve your goals, and once they know they can help you do that while also supporting a great organization, you're likely going to get some support. Aside from that, just being willing to talk about the trip to anybody and everybody has allowed me to find people who were willing to donate that I didn't even think of reaching out to initially. 4. If you had to give one piece of fundraising advice at this stage to anyone who has signed up thus far, what would it be? Start early, don't wait until the last minute. If you plan ahead of time and do a little bit at a time the task really isn't that daunting. 5. Similarly, If you could say one thing to someone who wants to take on one of our trips but might be a bit worried about fundraising for it, what would that be? Though the amount of money required may seem overwhelming, you'd be surprised how much you can raise if you get creative and put your mind to it. 6. Finally, What's your biggest single source of motivation for taking on this adventure? This upcoming May I'll be trekking to the Everest Base Camp to fundraise funds for Big Brothers Big Sisters Bay. Big Brothers Big Sisters envisions a world where all children have the opportunity to achieve their full potential. They provide youth ages 7-12 with strong and enduring one-to-one friendships that change their lives for the better, forever. Growing up the program was transformational for me, both as a mentor and a mentee. Any and all support is appreciated as I begin my fundraising journey to support this amazing organization. As a thank you for those who have supported me in my fundraising efforts, I'll be shipping out a high-quality picture I take on the adventure to everybody who helped turn this dream into a reality. For those who donated $50+ the photo will be framed. Thanks in advance! If you’d like to hear more fundraising stories check out our blog and if you’d like to donate to Liam’s cause see the donate button above or click here.